"Marty is extremely smart and knowledgeable about the law and regulations in the environmental area. He is also able to communicate effectively with people that do not have as much technical knowledge..."
Marty Booher practices within the oil and gas, renewable and clean energy, utilities, power, pipeline and steel industries. 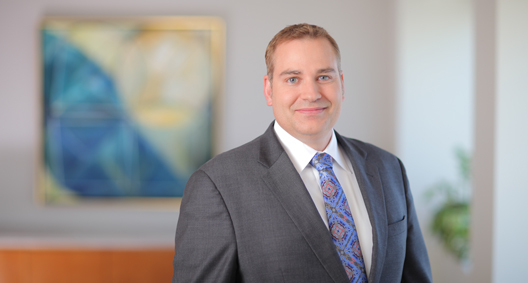 He has significant experience representing and advising clients on complex environmental litigation, transactions, financing, remediation and project development matters throughout the United States. With a strong environmental background and understanding of the issues facing the industry, Marty brings a practical, results-oriented approach to his practice. He leads the firm’s Environmental team, named in 2017 as Practice Group of the Year by Law360. Marty formerly served as co-leader of the firm’s national Energy industry team, which was named a 2015 Practice Group of the Year by Law360. Develop and implement due diligence strategies for merger, stock and asset purchase/sale, and financing transactions involving some of the largest project finance, mergers and acquisitions in the energy industry within the past several years, including the negotiation of provisions of purchase and sale agreements and side agreements governing post-closing allocation of environmental attributes and liabilities associated with the company or asset being transferred or financed. Advise energy companies on the environmental and regulatory risks and opportunities presented by the production of shale in the United States. Advise oil and gas companies in the preparation and implementation of drilling programs in Ohio and Pennsylvania, including advice on compliance with state and federal securities laws, tax treatment of intangible drilling costs, and the use of 1031 reverse like-kind exchanges and their impacts on the structure of the preferred drilling programs. Advise clients regarding the siting, licensing, development and acquisition of liquefied natural gas terminals in the United States under the Natural Gas Act and the Deepwater Port Act, and natural gas pipelines and storage facilities under the Natural Gas Act, including but not limited to assistance with Clean Air Act, Clean Water Act (Sections 401, 402 and 404), U.S. Coast Guard, U.S. Maritime Administration, Federal Energy Regulatory Commission and Coastal Zone Management Act licensing matters; compliance counseling related to the National Environmental Policy Act (NEPA) and General Conformity obligations; development of preemption and public trust doctrine arguments and strategies; and administrative appeals related to the Coastal Zone Management Act. Advise a London-based hedge fund and structure and prepare credit agreements and supporting documentation to provide short-term working capital to iron ore mines and sugar production facilities in Mexico on a per-trade basis. Counsel clients in the renewable fuels sector, including advice on compliance and participation in the federal renewable fuels program, EPA enforcement related to Renewable Identification Numbers (RINs), contracting and trading of RINs (including disputes), ongoing regulatory initiatives to revise the federal renewable fuels program and to increase ethanol blend restrictions, and ethanol/sugar cane opportunities in Brazil. Represent a leading supplier of wind turbines and several wind energy developers on various issues, including preparing responses to calls issued by the Bureau of Ocean Energy Management (BOEM) for offshore lease blocks; providing strategic counsel in resolving disputes with the U.S. Army Corps of Engineers, the U.S. Coast Guard and the Federal Aviation Administration; and working with state and federal resource agencies to address concerns related to potential environmental impacts associated with proposed projects. Acted as project development counsel to the developer of the Atlantic Wind Connection, a proposed 350-mile subsea electric cable carrying 6,000 megawatts of power from future offshore wind turbines off the U.S. East Coast, including providing strategic advice and support on federal and state permitting/licensing efforts and environmental review requirements, and successfully obtaining a determination of no competitive interest for the right-of-way grant to be issued by BOEM. Advise companies on PSD/NSR applicability issues for planned changes and expansion activities and in obtaining new and revised Clean Air Act permits, including the approvals required to address greenhouse gas emissions and to incorporate the impacts of historic and unpermitted facility modifications. Advise clients on various issues related to climate change, including generation of offsets and emission reduction credits, participation in the Carbon Disclosure Project, development of strategic responses to shareholder proposals and institutional investors seeking enhanced climate change-related disclosures, applicability and impact of domestic initiatives to regulate greenhouse gas emissions, and identification and analysis of potential climate change risks and liabilities associated with assets and companies targeted for acquisition. Representing a natural gas industry trade association in developing the association’s comments and strategic legal response to the EPA’s proposal to overhaul its regulations governing the presence of polychlorinated biphenyls (PCBs) in natural gas pipelines and related equipment. Represented a wood furniture manufacturer in developing comments on the EPA’s proposed air toxic standards for industrial boilers (known as the Boiler MACT), which led to several beneficial changes to EPA’s final regulations. Provide strategic advice to clients regarding issues related to the siting, licensing and financing of a biomass-fired electric generating facility and a bio-diesel manufacturing facility on historically contaminated properties, including the negotiation of liability protections/covenants with federal and state environmental regulators and implementation of other “outside the box” environmental risk management solutions. Providing strategic compliance and business counseling to several manufacturing and energy clients in all EHS areas with a particular emphasis on federal and state programs under the Clean Air Act. Represent performing parties at Superfund sites in efforts to negotiate consent decrees/administrative settlements and resolve natural resource damage claims with state and federal regulators, resolve and negotiate private party settlements, and implement investigation activities, interim actions and final remedies. Work with Brazilian legal counsel to advise manufacturing and energy clients in understanding the environmental liability regimes in Brazil and in developing effective risk management solutions to address potential liability issues. Advise electric utilities concerning the disclosure of climate change and EHS risks in filings with the Securities and Exchange Commission. Assist clients in the development, preparation, implementation, evaluation and integration of EHS management systems and audit programs. Advise trustees and lenders on the development of environmental management systems and policies to assist in screening potential business opportunities and provide guidance and advice on the potential environmental risks associated with customer activities, including but not limited to 1031 reverse like-kind exchanges in the oil and gas industry. Assist clients in the analysis, preparation, and negotiation of power purchase and tolling agreements between electricity generators and off-takers, which allocate risks and liabilities associated with compliance with greenhouse gas and other environmental compliance obligations, including the allocation of responsibility for emission allowance costs and capital expenditures.